Peter Sloterdijk first became known in this country for his late 1980s Critique of Cynical Reason, which confronted headlong the „enlightened false consciousness“ of Habermasian critical theory. Two decades later, after spending seven years in India studying Eastern philosophy, he is now attracting renewed interest for his writings on politics and globalization and for his magnum opus Spheres, a three-volume archaeology of the human attempt to dwell within spaces, from womb to globe: Bubbles, 1998; Globes, 1999; Foam, 2004, all forthcoming from Semiotext(e). In Neither Sun nor Death, Sloterdijk answers questions posed by German writer Hans-Jürgen Heinrichs, commenting on such issues as technological mutation, development media, communication technologies, and his own intellectual itinerary. Iconoclastic and provocative, alternatively sparkling and bombastic, a child of ’68 and a libertarian, Sloterdijk is the most exciting and controversial German philosopher to appear on the world scene since Nietzsche and Heidegger. Like Nietzsche, Sloterdijk remains convinced that contemporary philosophers have to think dangerously and let themselves be „kidnapped“ by contemporary „hypercomplexities“; they must forsake our present humanist and nationalist world for a wider horizon at once ecological and global. 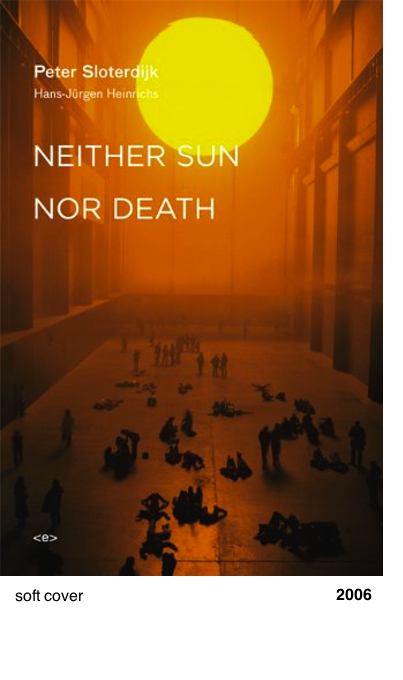 Neither Sun nor Death is the best introduction available to Sloterdijk’s philosophical theory of globalization. It reveals a philosophe extraordinaire, encyclopedic and provocative, as much at ease with current French Theory (Gilles Deleuze, Paul Virilio, Gabriel Tarde) as with Heidegger and Indian mystic Osho Rajneesh.